The round was exceptionally exciting as three games ended with a tiny margin. The fans could enjoy quite many interesting games in the last round. The round ended with derby games and games ending by tiny margin. Here is the last round review presented by ESL. Atenas defeated Quimsa in Cordoba 75-63. Worth to mention a great performance of point guard Franco Baralle (177-99) who helped to win the game recording 17 points and 4 steals. 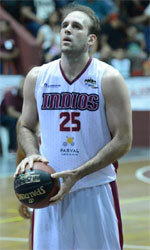 The former international Nicolas Romano (200-87) contributed with 15 points and 8 rebounds for the winners. American-Jamaican center Torin Francis (210-83, college: Notre Dame) answered with 19 points and 9 rebounds for Quimsa. Quimsa will play next round against strong Libertad Sunchales trying to get back on the winning streak. Atenas will try to continue on its current victory against Quimsa in Santiado del Estero. The most crucial game of the last round was a loss of Comunicaciones (1-1) in Mercedes. Hosts were defeated by Estudiantes C. (3-0) 68-55. American-Dominican forward Angel Nunez (203-91, college: S.Florida) stepped up and scored 22 points and 6 rebounds for the winners and Daviyon Draper chipped in 12 points and 9 rebounds. At the losing side the former international Selem Safar (190-87) responded with 16 points. Estudiantes C. will have a break next round, and it should allow them to practice more before next game. Comunicaciones will play again on the road against Estudiantes C. in Concordia and it may be a tough game between close rivals. An interesting game was also home defeat of Hispano Am. in a game in Rio Gallegos versus Ferrocarril (#2) 91-86. Mariano Fierro nailed a double-double by scoring 16 points, 13 rebounds and 5 assists for the winning side. Fernando Podesta came up with 26 points for Hispano Am. in the defeat. Ferrocarril's supporters look forward to an exciting derby game next round, where their team will travel locally in Buenos Aires to the arena Obras Basket. A very interesting game took place in Cordoba. It ended with only three-point defeat on the road of Libertad Sunchales (1-2) to Instituto (2-0) 78-75 on Tuesday evening. Facundo Pinero fired 14 points, 5 rebounds and 4 assists for the winners. Instituto will have a break next round. Libertad Sunchales will play at home against Quimsa and it may be a tough game between close rivals. Important game to mention about took place in Buenos Aires. Obras Basket (1-1) saved a 3-point victory on the road edging Ferrocarril (1-1) 77-74 in the fight for the second place. It was a very good performance for Maurice Kemp who helped to win the game recording a double-double by scoring 30 points and 10 rebounds. Obras Basket will face San Lorenzo in Almagra in the next round and it will be for sure the game of the week. Ferrocarril's supporters look forward to an exciting derby game next round, where their team will travel locally in Buenos Aires to the arena Obras Basket. Other games in round 1 were not that significant. Winless Weber Bahia lost to undefeated Gimnasia on the road 56-60. Estudiantes C. won against Regatas C. on its own court 72-65. Penarol lost to undefeated Gimnasia in Comodoro Rivadavia 65-75. Comunicaciones managed to beat Regatas C. at home 78-72. Winless La Union was defeated by San Martin C. on the opponent's court 82-76. Atenas beat Libertad S. in a home game 82-76. Winless Olimpico LB was destroyed by Libertad S. on the road 88-56. Instituto outscored Quimsa on its own court 88-65. Quilmes MP recorded a loss to Argentino in Junin 89-78. San Lorenzo defeated Boca Jrs at home 94-83. Argentino was smashed by Penarol on the opponent's court 95-62. Quilmes MP won against Argentino in a home game 95-90. Winless Olimpico LB unfortunately lost to Quimsa on the road 78-96. San Martin C. lost to undefeated Estudiantes C. on its own court 84-88. Winless La Union was defeated by Regatas C. in Corrientes 84-86. Winless Hispano Am. lost to defending champion San Lorenzo at home 84-100. Obras Basket lost to Boca Jrs on the opponent's court 56-66. The most impressive performance of 1st round was 11 points and 7 rebounds by Diego Romero of Gimnasia. The most crucial game of the last round was a loss of Comunicaciones (1-1) in Mercedes. Hosts were defeated by Estudiantes C. (3-0) 68-55. American-Dominican forward Angel Nunez (203-91, college: S.Florida) stepped up and scored 22 points and 6 rebounds for the winners and American forward Daviyon Draper (201-94, college: FIU) chipped in 12 points and 9 rebounds. Four Estudiantes C. players scored in double figures. At the losing side the former international Selem Safar (190-87) responded with 16 points and American forward Novar Gadson (201-89, college: Rider, agency: DTMones) scored 7 points and 7 rebounds. Estudiantes C. will have a break next round, and it should allow them to practice more before next game. Comunicaciones will play again on the road against Estudiantes C. in Concordia and it may be a tough game between close rivals. No shocking result in a game when Gimnasia (2-0) beat Weber Bahia (0-1) in Comodoro Rivadavia 60-56 on Friday. Gimnasia outrebounded Weber Bahia 45-34 including 33 on the defensive glass. It was a very good performance for Dominican center Eloy Vargas (211-88, college: Kentucky, agency: Duran International) who helped to win the game recording a double-double by scoring 13 points and 11 rebounds. The former international Sebastian Vega (200-88) contributed with 12 points and 9 rebounds for the winners. Point guard Fermin Thygesen (187-98) answered with 11 points, 7 rebounds and 4 assists and point guard Facundo Corvalan (188-98) added 12 points and 4 assists in the effort for Weber Bahia. Gimnasia will face Penarol in Mar del Plata in the next round and it will be for sure the game of the week. Weber Bahia will play at home against Argentino and it may be a tough game between close rivals. Rather expected game when Regatas Corrientes (1-2) lost to Estudiantes C. (3-0) in Concordia 65-72 on Sunday. It was a very good performance for American forward Daviyon Draper (201-94, college: FIU) who helped to win the game recording 15 points and 9 rebounds. Venezuelan swingman Pedro Chourio (186-90, agency: Pro Sports) contributed with 16 points and 5 rebounds for the winners. Four Estudiantes C. players scored in double figures. The former international Paolo Quinteros (188-79) answered with 15 points and the former international forward Fabian Ramirez (193-90) added 8 points and 7 rebounds in the effort for Regatas Corrientes. Estudiantes C. will face Comunicaciones in Mercedes in the next round and it will be for sure the game of the week. Atenas defeated Quimsa in Cordoba 75-63. Worth to mention a great performance of point guard Franco Baralle (177-99) who helped to win the game recording 17 points and 4 steals. The former international Nicolas Romano (200-87) contributed with 15 points and 8 rebounds for the winners. Four Atenas players scored in double figures. American-Jamaican center Torin Francis (210-83, college: Notre Dame) answered with 19 points and 9 rebounds and the former international point guard Nicolas De-los-Santos (180-88) added 11 points and 4 assists in the effort for Quimsa. Quimsa will play next round against strong Libertad Sunchales trying to get back on the winning streak. Atenas will try to continue on its current victory against Quimsa in Santiado del Estero. Gimnasia used a home court advantage and won against the opponent from Mar del Plata 75-65 on Sunday night. It was a very good performance for point guard Lucas Perez (185-87) who helped to win the game recording 11 points, 5 rebounds and 4 assists. The former international forward Franco Giorgetti (201-92) contributed with 11 points and 8 rebounds for the winners. Five Gimnasia players scored in double figures. Naturalized Italian center Damian Tintorelli (204-81) answered with a double-double by scoring 18 points and 13 rebounds and the former international point guard Nicolas Gianella (186-78) added 16 points in the effort for Penarol. Penarol's coach Leonardo Gutierrez rotated twelve players in this game, but that didn't help. Gimnasia will face again Penarol in Mar del Plata in the next round and it will be for sure the game of the week. There was a minor upset when Regatas Corrientes (1-2) lost to Comunicaciones (1-1) in Mercedes 72-78 on Friday. Comunicaciones forced 20 Regatas Corrientes turnovers. It was a very good performance for American forward Novar Gadson (201-89, college: Rider, agency: DTMones) who helped to win the game recording a double-double by scoring 18 points and 10 rebounds. His fellow American import point guard Kyle Davis (183-95, college: Dayton, agency: Duran International) contributed with 16 points and 6 rebounds for the winners. Guard Juan Arengo (190-96) answered with 19 points and 9 rebounds and American swingman Anthony Smith (195-86, college: Liberty) added 19 points and 10 rebounds in the effort for Regatas Corrientes. Four Regatas Corrientes players scored in double figures. Both coaches used bench players which allowed the starters a little rest for the next games. Comunicaciones will face Estudiantes C. in Concordia in the next round and it will be for sure the game of the week. A very interesting game took place in Cordoba. It ended with only three-point defeat on the road of Libertad Sunchales (1-2) to Instituto (2-0) 78-75 on Tuesday evening. Forward Facundo Pinero (200-88) fired 14 points, 5 rebounds and 4 assists for the winners. Italian-Uruguayan guard Leandro Garcia Morales (186-80, college: Texas A&M, agency: Pro Sports) chipped in 21 points. Marcos Saglietti (190-86) produced 22 points and 5 assists and Nicolas Copello (194-92) added 17 points and 6 rebounds respectively for lost side. Instituto will have a break next round. Libertad Sunchales will play at home against Quimsa and it may be a tough game between close rivals. San Martin Corrientes used a home court advantage and defeated the opponent from Formosa 82-76 on Sunday night. San Martin Corrientes dominated down low during the game scoring 46 of its points in the paint compared to La Union's 26. San Martin Corrientes forced 19 La Union turnovers. La Union was plagued by 25 personal fouls down the stretch. It was a very good performance for American power forward Lee Roberts (201-87, college: Findlay, OH) who helped to win the game recording a double-double by scoring 21 points and 14 rebounds. Point guard Lucas Faggiano (189-89, college: LIU Brooklyn) contributed with 21 points and 4 assists for the winners. San Martin Corrientes' coach Sebastian Gonzalez used a ten-player rotation which allowed the starters a little rest for the next games. Naturalized Spanish guard Jonathan Maldonado (188-90) answered with 14 points and 7 rebounds and naturalized Italian swingman Anibal Marin (199-82) added 11 points and 6 rebounds in the effort for La Union. Four San Martin Corrientes and five La Union players scored in double figures. San Martin Corrientes will face again La Union (#5) in Formosa in the next round. There was no surprise when Libertad Sunchales (1-2) lost to Atenas (2-0) in Cordoba 76-82 on Sunday. Atenas made 16-of-19 free shots (84.2 percent) during the game. It was a very good performance for the former international swingman Juan-Emiliano Fernandez (196-91) who helped to win the game recording 19 points and 4 assists. Power forward Fernando Martina (200-81) contributed with 15 points and 6 rebounds for the winners. Four Atenas players scored in double figures. Martin Cuello (193-93) answered with 23 points and 6 rebounds and American center Khalil Kelley (203-91, college: Pacific) added 14 points and 12 rebounds in the effort for Libertad Sunchales. Libertad Sunchales' coach rotated ten players in this game, but that didn't help. Atenas will face Quimsa (#4) in Santiado del Estero in the next round. Libertad Sunchales will play at home against Quimsa and it may be a tough game between close rivals. We could consider it a predictable result in the game between close teams when Libertad Sunchales (1-2) crushed at home Olimpico de La Banda (0-2) 88-56 on Friday. Libertad Sunchales dominated down low during the game scoring 48 of its points in the paint compared to Olimpico de La Banda's 26. Libertad Sunchales looked well-organized offensively handing out 27 assists comparing to just 11 passes made by Olimpico de La Banda's players. It was a very good performance for center Agustin Caffaro (206-95) who helped to win the game recording 15 points and 9 rebounds. Martin Cuello (193-93) contributed with 17 points (on 7-of-8 shooting from the field) for the winners. Five Libertad Sunchales players scored in double figures. American swingman Bashir Ahmed (201, college: St.John's, agency: Two Points) answered with 22 points and Spanish-Brazilian center Caio Silveira-Torres (211-87, agency: Interperformances) added 10 points and 7 rebounds in the effort for Olimpico de La Banda. The winner was already known earlier in the game, so both coaches allowed to play the bench players saving starting five for next games. Libertad Sunchales will face Quimsa (#4) in Santiado del Estero in the next round. Olimpico de La Banda will play at home against Atenas and hope to win that game. The game between closely ranked teams ended with Quimsa's (1-2) road loss to Instituto (2-0) in Cordoba 65-88 on Thursday. It was a very good performance for the former international swingman Luciano Gonzalez (190-90) who helped to win the game recording 29 points. Italian-Uruguayan guard Leandro Garcia-Morales (186-80, college: Texas A&M, agency: Pro Sports) contributed with 18 points (made all of his seven free throws) for the winners. The former international Leonel Schattmann (193-87) answered with 17 points and American-Jamaican center Torin Francis (210-83, college: Notre Dame) added 8 points and 10 rebounds in the effort for Quimsa. Quimsa's coach Silvio Jose Santander gave up on the game allowing to play ten players seeing no chance for a win. Instituto will have a break next round. Quimsa will play at home against Atenas and it may be a tough game between close rivals. Rather predictable result when Argentino (1-2) won against Quilmes MP (1-1) in Junin 89-78 on Sunday. Argentino dominated down low during the game scoring 48 of its points in the paint compared to Quilmes MP's 28. Quilmes MP was plagued by 24 personal fouls down the stretch. It was a very good performance for Canadian Nicholas Wiggins (198-91, college: Z*Orangeville A's) who helped to win the game recording a double-double by scoring 16 points and 13 rebounds. Swingman Guido Mariani (193-94) contributed with 22 points for the winners. Argentino's coach Ricardo Daniel Maffei used a ten-player rotation which allowed the starters a little rest for the next games. Mateo Bolivar (187-92) answered with 19 points and 6 rebounds and point guard Luciano Tantos (185-88) added 2 points, 9 rebounds and 8 assists in the effort for Quilmes MP. Argentino will face Weber Bahia (#5) in Bahia Blanca in the next round. San Lorenzo used a home court advantage and beat the opponent from Buenos Aires 94-83 on Saturday night. It was a very good performance for international point guard Nicolas Aguirre (188-88) who helped to win the game recording 13 points, 7 rebounds and 7 assists. International Maximo Fjellerup (198-97) contributed with 18 points for the winners. International guard Eric Flor (186-93) answered with 23 points and 6 assists and American power forward Roquez Johnson (201-92, college: Mississippi St.) added 19 points in the effort for Boca Juniors. Five San Lorenzo and four Boca Juniors players scored in double figures. San Lorenzo will face Obras Basket (#4) in Buenos Aires in the next round. Boca Juniors will play at home against Hispano Am. and hope to win that game. We could consider it a predictable result in the game between close teams when Penarol (1-1) outplayed Argentino (1-2) in Mar del Plata 95-62 on Wednesday. Penarol dominated down low during the game scoring 54 of its points in the paint compared to Argentino's 28. Penarol forced 20 Argentino turnovers. They looked well-organized offensively handing out 28 assists comparing to just 13 passes made by Argentino's players. It was a very good performance for Lucas Arn (197-89) who helped to win the game recording 11 points, 9 rebounds and 4 assists. Forward Nicolas Lauria (202-88) contributed with 9 points, 8 rebounds and 5 assists for the winners. Four Penarol players scored in double figures. Canadian Nicholas Wiggins (198-91, college: Z*Orangeville A's) answered with 28 points and American center Raheem Bowman (211-90, college: St.Thomas, FL) added 5 points, 13 rebounds and 4 assists in the effort for Argentino. The winner was already known earlier in the game, so both coaches allowed to play the bench players saving starting five for next games. Penarol will face Gimnasia in Comodoro Rivadavia in the next round and it will be for sure the game of the week. Argentino will play on the road against Weber Bahia in Bahia Blanca and it may be a tough game between close rivals. There was a minor upset when Argentino (1-2) lost to Quilmes MP (1-1) in Mar del Plata 90-95 on Friday. Quilmes MP forced 19 Argentino turnovers. They looked well-organized offensively handing out 25 assists. Great defensive blocking was one of the keys in this match when Quilmes MP made 7 blocks. Argentino was plagued by 24 personal fouls down the stretch. It was a very good performance for Mateo Bolivar (187-92) who helped to win the game recording 30 points, 6 rebounds and 5 assists. Forward Eduardo Vasirani (200-91) contributed with 18 points, 9 rebounds and 5 blocks (on 9-of-11 shooting from the field) for the winners. Point guard Gaston Garcia (187-98) answered with 37 points (!!! ), 5 rebounds and 8 assists (made all of his eleven free throws !!!) and naturalized American Jonathan Slider (188-87) added 13 points in the effort for Argentino. Five Quilmes MP and four Argentino players scored in double figures. Quilmes MP will have a break next round. Argentino will play on the road against Weber Bahia in Bahia Blanca and it may be a tough game between close rivals. The game between closely ranked teams ended with Quimsa's (1-2) home victory over Olimpico de La Banda (0-2) in Santiado del Estero 96-78 on Sunday. Strangely Olimpico de La Banda outrebounded Quimsa 38-23 including a 19-5 advantage in offensive rebounds. They shot the lights out from three sinking 13 long-distance shots on high 59.1 percentage. Quimsa looked well-organized offensively handing out 24 assists. It was a very good performance for American-Jamaican center Torin Francis (210-83, college: Notre Dame) who helped to win the game recording 20 points and 9 rebounds. The former international point guard Nicolas De-los-Santos (180-88) contributed with 23 points and 4 assists (on 10-of-13 shooting from the field) for the winners. Cuban swingman Karel Guzman (188-95) answered with 20 points and 6 rebounds and the former international power forward Ivan Basualdo (202-90) added 13 points and 11 rebounds in the effort for Olimpico de La Banda. Both teams had four players each who scored in double figures. Quimsa will face Atenas in Cordoba in the next round and it will be for sure the game of the week. Olimpico de La Banda will play at home against Atenas (#1) and hope to win that game. Rather expected game when San Martin Corrientes (1-1) lost at home to Estudiantes C. (3-0) 88-84 on Wednesday. Estudiantes C. dominated down low during the game scoring 54 of its points in the paint compared to San Martin Corrientes' 34. San Martin Corrientes was plagued by 24 personal fouls down the stretch. It was a very good performance for American forward Daviyon Draper (201-94, college: FIU) who helped to win the game recording a double-double by scoring 24 points and 12 rebounds. Point guard Leonardo Vildoza (180-94) contributed with 17 points, 5 rebounds and 6 assists for the winners. Point guard Lucas Faggiano (189-89, college: LIU Brooklyn) answered with 19 points, 5 rebounds and 6 assists and American power forward Lee Roberts (201-87, college: Findlay, OH) added 20 points and 5 rebounds in the effort for San Martin Corrientes. Five Estudiantes C. and four San Martin Corrientes players scored in double figures. Estudiantes C. will face Comunicaciones in Mercedes in the next round and it will be for sure the game of the week. San Martin Corrientes will play on the road against La Union in Formosa and hope to win that game. The game between closely ranked teams ended with Regatas Corrientes' (1-2) home victory over La Union (0-2) 86-84 on Tuesday. It was a very good performance for American swingman Anthony Smith (195-86, college: Liberty) who helped to win the game recording 21 points. International Javier Saiz (206-94) contributed with a double-double by scoring 13 points and 10 rebounds for the winners. Four Regatas Corrientes players scored in double figures. Regatas Corrientes' coach Lucas Victoriano used an eleven-player rotation in such tough game. Naturalized Spanish guard Jonathan Maldonado (188-90) answered with 32 points and 8 rebounds and center Jose-Ignacio Alessio (203-87) added 13 points and 5 rebounds in the effort for La Union. Regatas Corrientes will have a break next round. La Union will play at home against San Martin Corrientes (#3) and it may be a tough game between close rivals. An interesting game was also home defeat of Hispano Am. in a game in Rio Gallegos versus Ferrocarril (#2) 91-86. Ferrocarril looked well-organized offensively handing out 23 assists. Forward Mariano Fierro (200-86) nailed a double-double by scoring 16 points, 13 rebounds and 5 assists for the winning side and the former international center Kevin Hernandez (204-91) accounted for 22 points and 10 rebounds. Four Ferrocarril players scored in double figures. Center Fernando Podesta (205-92) came up with 26 points and American guard Justin Hurtt (194-88, college: Tulsa, agency: HMS) added 16 points respectively for Hispano Am. in the defeat. Ferrocarril's supporters look forward to an exciting derby game next round, where their team will travel locally in Buenos Aires to the arena Obras Basket. Not a big story in a game when Hispano Am. (0-2) lost to San Lorenzo (2-0) in Rio Gallegos 84-100 on Thursday. San Lorenzo made 17-of-22 free shots (77.3 percent) during the game. San Lorenzo outrebounded Hispano Am. 41-26 including 16 on the offensive glass. It was a very good performance for Uruguayan center Mathias Calfani (204-92, agency: Pro Sports) who helped to win the game recording a double-double by scoring 19 points and 13 rebounds. The former international Marcos Mata (201-86) contributed with 15 points and 5 assists for the winners. Center Fernando Podesta (205-92) answered with 19 points and 6 rebounds and Daniel Hure (200-85) added 13 points and 9 rebounds in the effort for Hispano Am.Four San Lorenzo and five Hispano Am. players scored in double figures. San Lorenzo will face Obras Basket (#4) in Buenos Aires in the next round. Hispano Am. will play on the road against Boca Juniors in Buenos Aires and hope to win that game. Important game to mention about took place in Buenos Aires. Obras Basket (1-1) saved a 3-point victory on the road edging Ferrocarril (1-1) 77-74 in the fight for the second place. Obras Basket made 17-of-22 free shots (77.3 percent) during the game. It was a very good performance for American forward Maurice Kemp (203-91, college: E.Carolina, agency: Duran International) who helped to win the game recording a double-double by scoring 30 points and 10 rebounds. His fellow American import point guard Dion Dixon (190-89, college: Cincinnati, agency: Duran International) contributed with 12 points for the winners. Forward Mariano Fierro (200-86) answered with 18 points and 8 rebounds and the former international center Kevin Hernandez (204-91) added 14 points and 5 assists in the effort for Ferrocarril. Four Ferrocarril players scored in double figures. Obras Basket will face San Lorenzo in Almagra in the next round and it will be for sure the game of the week. Ferrocarril's supporters look forward to an exciting derby game next round, where their team will travel locally in Buenos Aires to the arena Obras Basket. There was a small surprise when Boca Juniors (1-1) defeated Obras Basket (1-1) in Buenos Aires 66-56 on Wednesday. Quite impressive performance for guard Bruno Sansimoni (190-96) who helped to win the game recording 11 points. American power forward Roquez Johnson (201-92, college: Mississippi St.) contributed with 6 points and 9 rebounds for the winners. American point guard Dion Dixon (190-89, college: Cincinnati, agency: Duran International) answered with 12 points and 5 rebounds and point guard Fernando Zurbriggen (185-97) added 9 points and 6 rebounds in the effort for Obras Basket. Boca Juniors will face Hispano Am. (#5) in Rio Gallegos in the next round. Obras Basket's supporters look forward to an exciting derby game next round, where their team will face at home their local rival from Buenos Aires Ferrocarril.